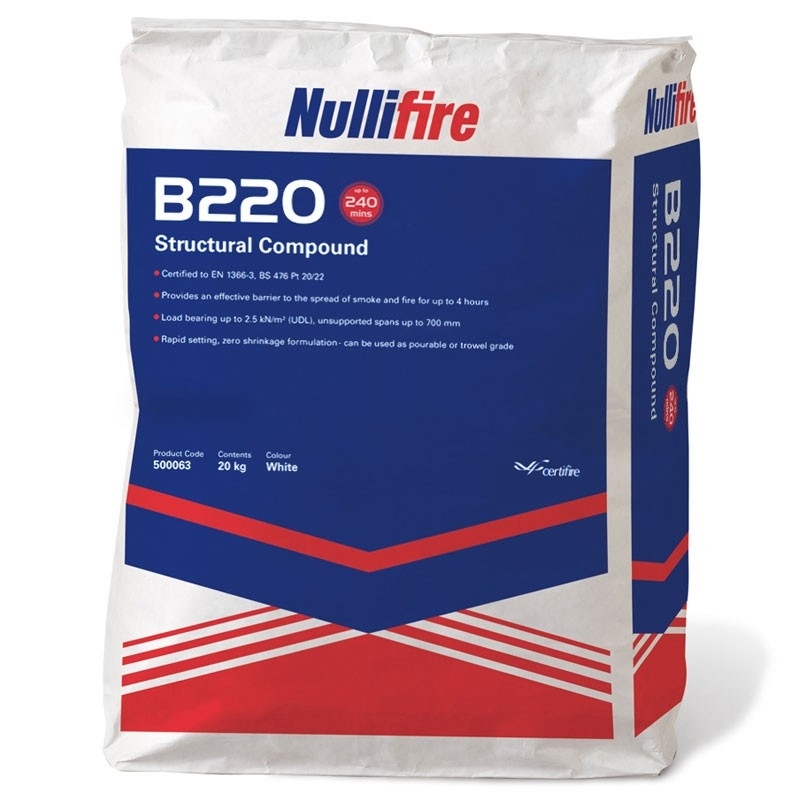 Nullifire FR220 Firestopping Compound is a single part gypsum-based compound providing up to 4 hours fire resistance. 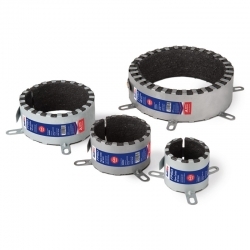 FR220 Firestopping Compound provides an effective barrier to the spread of smoke and fire resistance tested in accordance with EN 1366-3, ETAG 026 and Classiffcation 13501:2. FR220 Firestopping Compound is used to stop the spread of smoke and fire along services that pass through compartment walls and floors, whilst providing an unsupported load bearing capacity. The system also provides thermal, acoustic and air sealing performance. FR220 is suitable for the following service penetrations; single and bunched cables, cable trays, cable ladders, trunking, steel and copper pipes, unsupported multiple ducting/ damper penetrations, PVC and uPVC pipes. Typical areas of use include health and leisure facilities, schools, universities, commercial. retail and industrial buildings. For spans greater than 700 mm or parameters outside the scope as detailed in the TDS including seals that require a UDL in excess of 2.5 kN/ m2, please contact our Technical Team for advice. Would this product be used to seal joints/inside and outside corners of 60min 15mm gyproc fire board, to seal fire board around structural steel posts? If Yes what is the drying time, can it be decorated over and what is the coverage of a 20kg bag. Generally we propose the use of Nullifire FB750 Coated Batt for primary seals or Nullifire FS702 Waterborne Intumescent Acrylic Sealant for linear gaps. 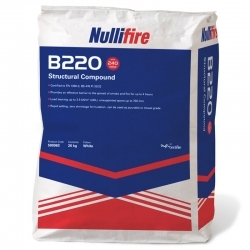 Nullifire FR220 Firestopping Compound could be used, but is generally only required for load bearing floor seals and may cause mould if the plasterboard is not appropriately treated. Please see details for batt and mastic solutions on the above links. These products can be over coated with any standard trade emulsion to achieve a decorative finish. Over coating can be completed after 30 days (full mastic curing time). No, unfortunately the product was not designed or tested for this.